Respawn Entertainment is attempting to tell a different kind of Star Wars story in Star Wars Jedi: Fallen Order, it's upcoming single-player, narrative-driven third-person action game. The studio, known for creating mechanically rich and ambitious multiplayer first-person shooters, such as Titanfall, Titanfall 2 and Apex Legends, is letting us experience just how disastrous the fall of the Jedi Order really was. Set shortly after the events of Star Wars: Revenge of the Sith, we will take on the role of Cal Kestis, played by actor Cameron Monaghan of Gotham fame, a young Padawan that survived the execution of Order 66 – the purge of the Jedi Knights orchestrated by Emperor Palpatine – as he attempts to continue his training from the shadows, while attempting to evade the Empire and its deadly Jedi-hunting Inquisitors. What is it about this period that the studio found so exciting? Aaron Contreras, head of narrative at Respawn, used his time speaking at Celebration to reaffirm his belief that this time is so fascinating because it represents one of the biggest challenges the Jedi have ever faced – absolute extinction. "For a thousand generations, the Jedi were the Guardians of peace and justice in the Old Republic, before the dark times and before the Empire. Our story is set during those dark times. The Empire is at the height of its power. The Jedi are reviled as traitors; the Inquisitors roam the galaxy hunting for any surviving Jedi and other force sensitives." It's here where Jedi: Fallen Order picks up. We will meet Cal on Bracca, a brand new planet engineered by Respawn in collaboration with Lucasfilm, that's located off in the Mid Rim – a part of the galaxy that was once home to some of the bloodiest battles between the ancient Jedi Order and the Sith in the days of The Old Republic, thousands of years before the rise of Darth Vader and the fall of the Republic. Now, Bracca it's strewn with wreckage as a result of the Clone Wars; Cal is a member of the Scrapper Guild, hiding his past in plain sight, attempting to conceal his true power and identity. "Cal works on tearing apart derelict starships – mostly decommissioned Capital ships from the Clone Wars – and it’s really hard and dangerous work. The dark times have shaped Cal, and so he keeps his head down, pulling himself back from the world around him. He can’t trust anybody with the secrets that he carries for fear that it will endanger them," Contreras continues, though the young Padawan can't stand on the sidelines forever – it just isn't in his character. "Eventually, Cal does get involved, and it puts the Inquisition on his trail. He’ll have to face the trauma of his past and learn to trust in new allies and The Force. If the Jedi Order is ever to rise again, Cal must persist through failure and adapt. He will gain a new understanding of what it means to be a Jedi – a Guardian of peace and justice after the bad guys have won and all hope has been lost." As you've probably gathered by now, building an authentic Star Wars story is a huge focus for Respawn with Jedi: Fallen Order. The studio has reportedly brought in six narrative designers to work on the game – to put that in perspective, EA Motive had two narrative designers on staff to oversee the direction of the single-player campaign for Star Wars Battlefront 2. Respawn's own team includes Contreras, who oversaw the reactive narrative component to Mafia 3, and Chris Avellone, who, alongside countless other projects, wrote Knights of the Old Republic 2. 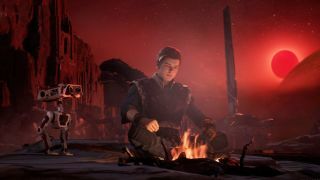 Fallen Order will also see famed Star Wars writers getting involved in crafting this new corner of the universe, such as Matt Michnovetz – who is perhaps best known as the head writer for the Star Wars: The Clone Wars' sixth and seventh seasons, as well as a writer for episodes of Star Wars Rebels' second season. An impressive grouping of narrative designers and writers have assembled behind Fallen Order, and it's doing enough to alleviate any worries that we may have had that Respawn wouldn't well positioned to create a single-player, narrative-driven game. For now, at least – we're still yet to play it for ourselves, after all. We are creating a badass, kickass Jedi Star Wars game for people to love." Still, pulling this together has been easier said than done for Respawn. Building a game around a licensed IP is difficult at the best of times – it's easy to forget, but Rocksteady's Batman Arkham trilogy is still a bit of an outlier in the wider games industry. Batman is big, but it's no Star Wars; there is perhaps no brand in the world that is as big and as successful, let alone under such a substantial amount of scrutiny from the fanbase, as Star Wars. Honestly, it's kind of surprising we are getting something set in such a delicate and mysterious part of the canon at all. Blank describes the creation of the Fallen Order as a "labour of love" when he touches on the challenging, but necessary, processes in place to align the various parties with a vested interest in expanding the Star Wars universe. "It takes time, a lot of effort, and a lot of people having all sorts of conversations from across Lucasfilm, Respawn, EA, and Disney. When it comes to crafting something together with a specific story... as I said, it’s a labour of love. Everybody pitches in here, we all kind of get together and get straight to the point of making something incredible," he says, adding, "everybody is driving towards the same goal of creating a badass, kickass Jedi Star Wars game for people to love." Everything we've seen of Fallen Order so far would suggest that Respawn is undoubtedly on the right path to deliver. Respawn is working on walking a delicate line between creating new Star Wars lore and reusing fan-favourite assets and elements from established canon. It's one of the elements of Fallen Order's design that will ensure that it feels faithful to the universe it is set in while still bringing value to the table. "We had to use different approaches when creating existing things in the Star Wars universe and creating brand new content," says Fallen Order producer Kasumi Shishido, speaking at Star Wars Celebration. "We are introducing a lot of new planets and characters. Nailing down existing locations, for example, was really important for both teams. So we did that by going back and forth on style guides, concept art – and even now we still do full level playthroughs together [with Lucasfilm], over and over again, just to nail this." Want more Star Wars in your life? Why not check out the Star Wars 9 trailer and see the Rise of Skywalker for yourself. It's the new elements that have really caught our attention. In particular, there's Cal's droid BD-1 – or as it's known internally, 'Buddy-Droid 1' – whose voice has been created and performed by legendary Star Wars sound designer Ben Burtt. If that weren't enough, the basis for the droid was actually inspired by Contreras' own beloved dog. Hey, Contreras, I demand pictures of your dog in a mo-cap suit. Like, for real, make it happen. That group of new allies is going to be much needed, because Cal won't be able to fight the Empire and its deadly Imperial Inquisitors alone. In fact, the young Force user has caught the attention of an elite Inquisitor, the Second Sister, a character who seems to have her own strong connection with The Force, and her personal guard, the Purge Troopers. This would be a situation that would strike fear into the hearts of a seasoned Master Jedi, let alone a young Padawan apprentice that is yet to complete their training or have their hands on a fully functioning lightsaber. “We’re putting our heart and soul into this game"
While the Second Sister and the Purge Troopers may look entirely new if you've only been following along with the action as seen in the movies, they are actually coming from the larger pool of Star Wars storytelling. The Second Sister was created by writer Charles Soule and artist Giuseppe Camuncoli, introduced in issue #19 of Marvel's Darth Vader last August, should you be interested in diving into her backstory ahead of getting your hands on Fallen Order this November. The Purge Troopers were also introduced in the Darth Vader series of comics, and they are more than up for the challenge of cutting down whatever remains of the Jedi Order. Is that a frustrating answer? Absolutely. Does it make sense? I begrudgingly concede that it does. The truth is, I'm so eager for more information because Respawn looks to be carving out an awesome little corner of the Star Wars universe to play in. By throwing us all in at the deep end of the "dark times" of the galaxy, we will have the opportunity to enjoy a side to the franchise that we so rarely get to see explored. Star Wars Jedi: Fallen Order is set to launch November 15, 2019, on Xbox One, PlayStation 4, and PC.